Capable of supporting a three-inch engineer's vice and a heavy bashing. Built into a corner between two concrete walls. After a lot of head-scratching, I settled on a design which has fulfilled all those goals. A workshop! Your garage will do at a pinch. Free area between two walls of brick, breeze block or concrete. Various tools - plane, chisel, tenon saw, hammer drill, hammer etc. A good command of the spoken four-letter word. Quantities will depend on the size of the table. My table is 5 ft x 3 ft and uses planed timber. 3 inch x 2 inch pine for horizontals. 3/16 inch (minimum) rawlbolts or similar. These are anchors for brick/concrete for bolting horizontal supports firmly to a wall. 1/2 inch or 3/4 inch exterior quality or marine ply. 8mm dia coachscrews and bolts. Cut the four horizontals to size, and prepare the joints (see diagram). A tenon is used for making the joints. Decide on the height of the worktop. Then allowing for the thickness of the worktop, very carefully mark on the walls the center-line for the horizontal supports. Mark out hole centers for rawlbolts approximately 18 inches apart on wall. Using appropriate masonry bit, drill into wall, clean out hole and attach anchor bolts. Drill holes in the horizontals for rawlbolts, slip over rawlbolts, and bolt firmly to wall. Accuracy is crucial here since horizontals must all be at the same height and perfectly level. So now we have two horizontals anchored to the adjacent walls in the corner. Trial fit horizontal 3 to horizontal 2. Trial fit horizontal 4 to horizontal 1 and horizontal 3. 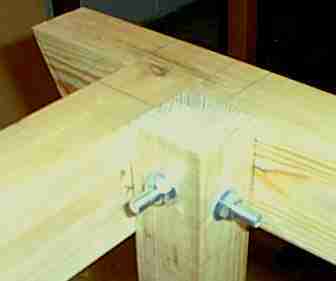 Support the corner of 3 and 4 temporarily using a leg of wood clamped to both horizontals. Mark out holes at corner in horizontals 3 and 4 for coachbolts for leg attachment. Coachbolts go through the leg at ninety degrees to each other, so they must be slightly staggered vertically. Drill out for bolts in both legs and horizontals - to ensure accuracy, drill from both sides of the material. Fit an adjustable foot to the leg. 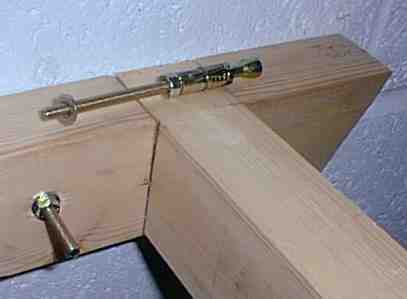 Glue, screw and clamp all joints corner joints with the leg bolted in place. The carcase is now complete. Cut the top to size and screw into carcase using 1 1/2" wood screws countersunk. 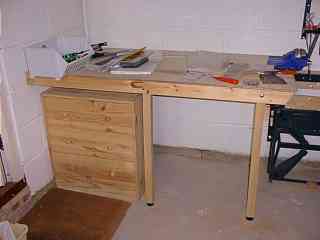 Drill worktop for vice. Note the bolts for the vice can either completely clear the horizontal, or be screwed straight into it. Adjust the foot until all edges are true. If your table is longer than about 5 ft, its a good idea to add a cross-piece and a second leg midway along H4.